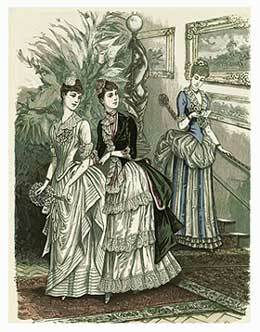 Fashion prints offer a colorful and in-depth view of the stylish fashions of the past. Their vivid color schemes, exquisite fabrics and decorative trims make a delightful collectible to display. The beautiful hand-colored antique fashion plates of the late 18th and 19th century are considered a collectible art form today. These prints were originally a means of illustrating the current style of dress for designers, artists, merchants, and manufacturers. They were most often found in ladies' magazines. 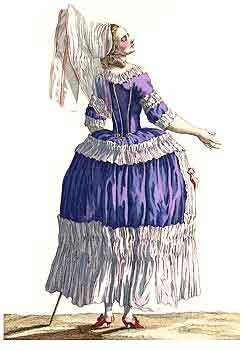 The widespread publication of fashion plates began in England and France in the late eighteenth century. The English periodical, The Lady's Magazine, issued its first uncolored plate in 1770 and a year later its first color hand-tinted plate. Although antique fashion plates offer a basic history of costume and fashion, some prints, especially of the Directorie or Empire period, frequently depict an idealistic image that was created by the artist. These beautiful drawings often were an exaggeration of the period fashions. 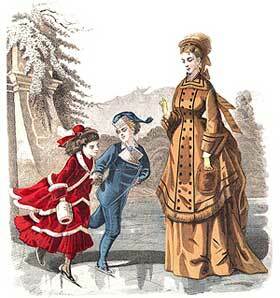 Fashion plates reached their height of popularity in the mid-1800s. By the end of the 19th century, one could find up to 100 hand-tinted plates in a single year of a magazine. Although most fashion designs throughout Europe were labeled Parisian, many of the fashion magazines were published in Germany (such as Modenwelt, Firmin-Didst, and Der Bazar). Copyright laws in Europe were not enforced and in America were non-existent, resulting in widespread piracy of fashion designs and plates. Also it was not uncommon for English and American magazines to modify and adapt French and German plates to appeal to their own readership. 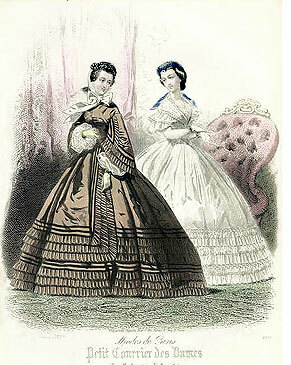 Young Ladies Journal, Godey's Ladies Magazine, Peterson's Magazine, and others, copied nearly all of their fashion plates. Most of these plates were printed on heavy paper and the coloring was applied by hand. 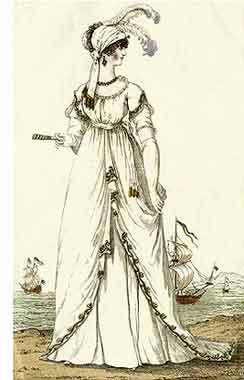 Early fashion plates typically showed single, elegantly dressed figures, with no additional backgrounds. By the mid-19th century, when color plates were most popular, backgrounds had graduated from a single chair or column to elaborate indoor and outdoor scenes. These scenes included activities such as attending a ball, an afternoon at home, promenading in the park, and an outing at the seashore. 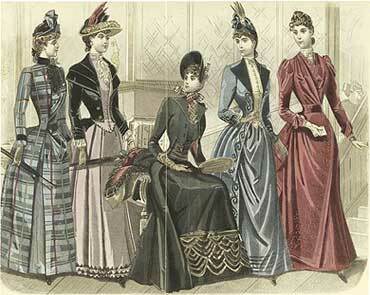 By the 1880s, American fashion magazines were including activities other than those of the leisure class. Often one would find color plates with a suggestion of a professional setting, such as figures with a typewriter or sewing machine. American periodicals often included the machine maker's name in an attempt at advertising. 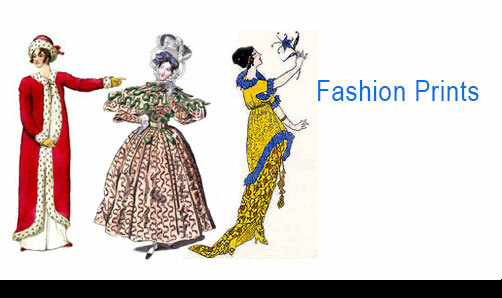 Antique & Vintage Fashion Prints - Make a Great Gift! 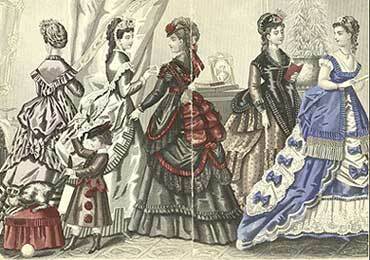 Collectors can find colored antique fashion plates in many places. Antique dealers and art galleries will charge top prices. Secondhand shops, charity outlets and small antique shops sometimes have framed prints hanging on the walls above furniture, often with lower prices. Other inexpensive places to look are frame shops and second hand bookstores in small towns. Now with the popularity of the internet, many web sites such as eBay, provide a vast variety of antique prints and fashion plates. As much attention should be given to the maintenance of fashion prints as to their acquisition. The value of a piece can be drastically diminished by improper care. The deep crease caused by folding for the insertion in the original magazine is usually fragile. Special care should be taken when handling this type of print. Lift it with both hands, to keep it from bending and never touch the printed area. In either storing or framing, the best protection is a nonacid tissue or matte board. Ultra-violet protection glass is also recommended.